2/0 Busbar, insulator and cover sold as unit. Available in red, white or black. Comes with mounting screws. Made in USA, NRTL recognized. 2/0 Busbar, insulator and cover sold as unit. Available in red, white and black. Comes with mounting screws. Made in USA, NRTL recognized. 5" 2/0 Busbar, insulator and cover sold as unit. Available in red, white and black. 1000amp positive or negative busbar with 3/8 inch studs. 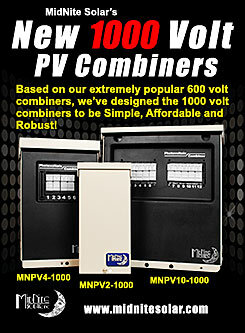 Used in the MNBCB-1000/50 and MNBCB-1000/100-Battery Combiners. This .063" thick copper bus has four fingers spaced at 3/4" (19mm) intervals. One box lug is provided that accommodates 14-1/0 AWG wire. MidNite ground busbar 3.45" long with Green screws! Two 1/0 & seven #6 wire slots. Comes with mounting screws. Made in USA, NRTL recognized. MNTBBN - Without insulators. Comes with 10-32 screws. 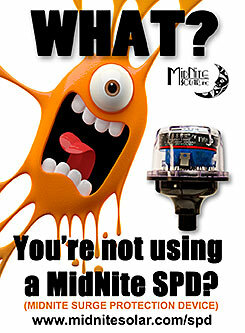 For use with the MidNite Shunt. Busbar 4.63" UL and CSA recognized. 180 amps. Made in USA. Mounts on 500 shunt. Same busbar used in the Nottagutter. Four battery cable studs and six position aux terminal busbar. Shunt sold separately.